All transactions are safe and secure with a reliable history in online purchasing behind each of our associates. Buy the Linus t-shirt to own Peanuts clothing and merchandise. Linus is often recognized for being Charlie's blanket toting best friend. He is very intelligent for his age and usually speaks like a philosopher even when he is sucking his thumb. While this act may undercut the average Joe, it seems to make Linus smarter. Apparently, he is able to fall deep into thought by blocking out the world with his thumb sucking. This design is available on a variety of products, including hoodies, tees, onesies, bibs and more. Be smart and grab a Linus t-shirt for your favorite gifted friend. 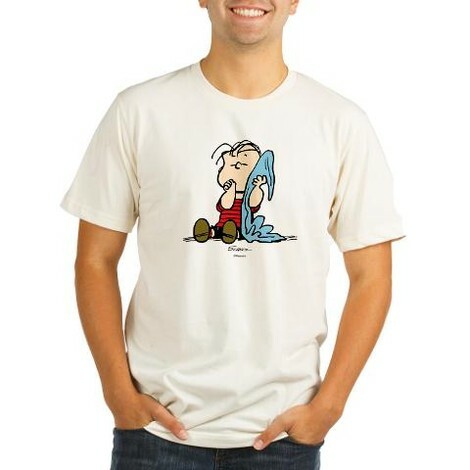 In addition to the Linus tee above, browse the Peanuts Clothing Gallery for more apparel like men's and women's clothes, kids shirts or hoodies.